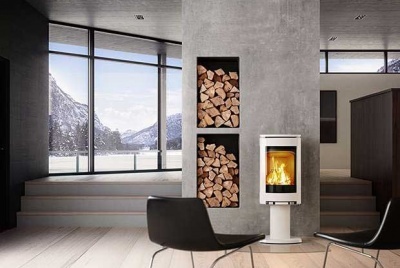 It’s no wonder we love our woodburning stoves — good-quality models can be more than 80 per cent energy efficient (compared to open fires at 15 per cent), not to mention that they run on wood, the cheapest form of fuel there is. After consulting Shropshire-based manufacturer Clearview Stoves as well as HETAS installer James Isaac, I bought the Clearview Pioneer Oven (which cost £1,890 including VAT) for my 18th century cottage. Fitting instuctions are as follows and there is also a video of the process above. Installation with HETAS-registered installer James cost me £2,600, which included the cost of supplying and fitting the twin-wall flue. 1. 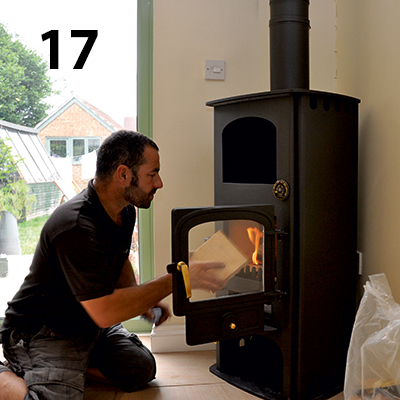 James starts the job by positioning and levelling up the woodburning stove. The floor is made from non-combustible material (tiles) so no hearth is required underneath for this installation. 2. 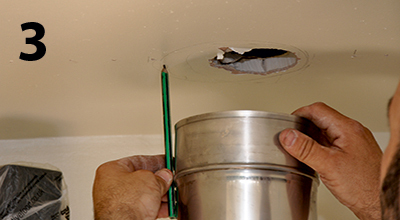 An exploratory hole – in line with the flue outlet on the stove – is made in the ceiling above. 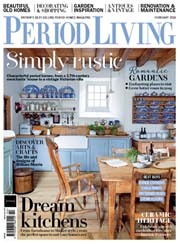 The survey showed that there is a suitable gap between the joists at this point, but care still needs to be taken to avoid wiring or pipework. 3. 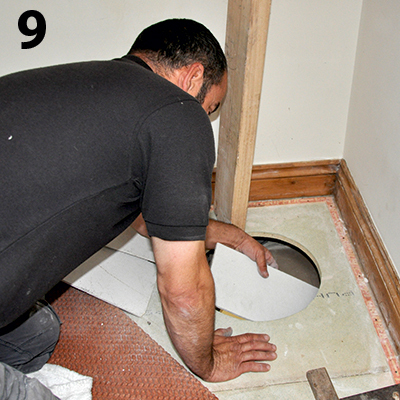 The hole is expanded, and after a careful inspection with a torch, no wiring or pipework is found. 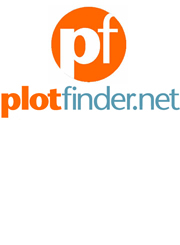 (If found you’ll need to bring in other tradespeople to reroute them.) With the way clear on this installation, James offers up the flue pipe from the burner to mark an accurate cut line on the ceiling. 4. 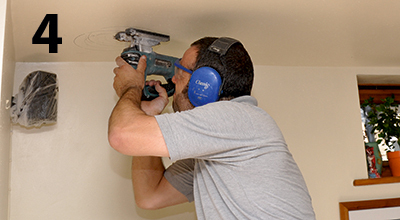 A jigsaw is used to cut out the hole in the ceiling for the flue. 5. The twin-wall flue is being routed through the house. 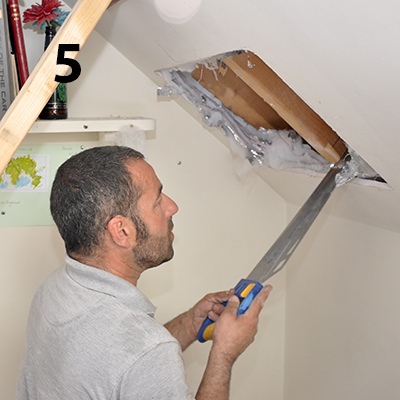 The survey showed that a roof joist would be in the way after the flue passed through the room above. 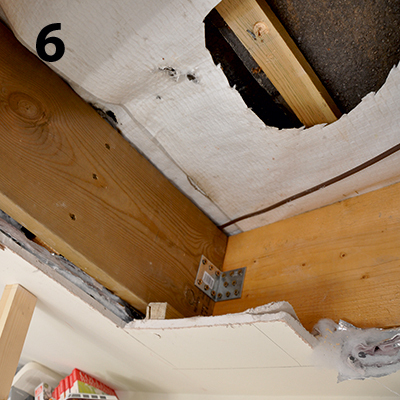 So, the plasterboard is cut away and with the joist supported, a section is removed to make way for the flue. 6. The roof joists above and below the one cut are ‘tied’ into it with new lengths of joist with brackets on the top and bottom. Long screws go through the centre of the new lengths of joist and into the cut ends on either side. By doing this, the strength lost by cutting the joist is, in turn, reinstated. 7. 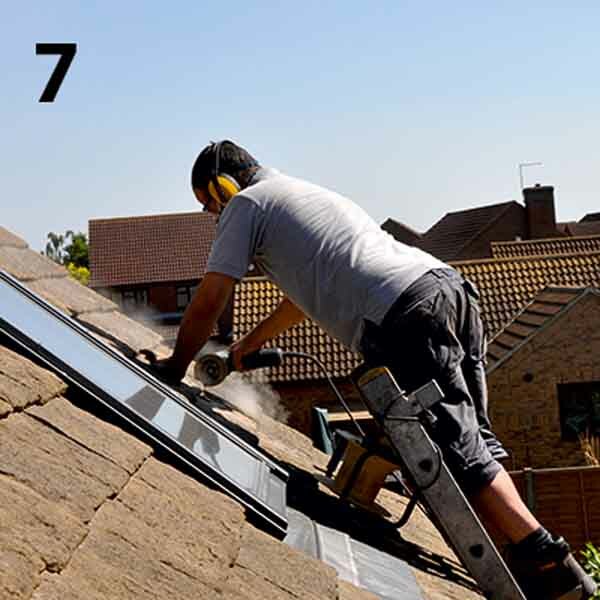 After marking a central hole for the flue inside, James then goes on to mark out the circular cut line on the roof tiles and cuts it out with an angle grinder. 8. 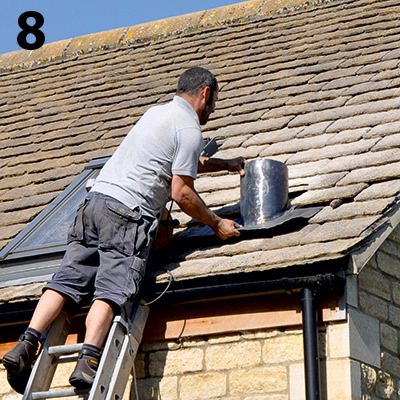 A lead roof cowl is then introduced; the flue pipe will eventually emerge through it towards the end of the installation. The cowl is slid under the tiles to create a weatherproof barrier. 9. 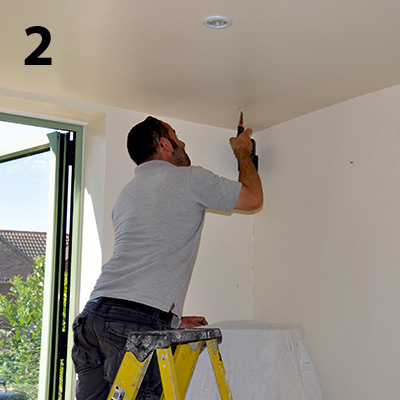 James uses fireboard to box in the space between the floor and ceiling where the flue will pass. 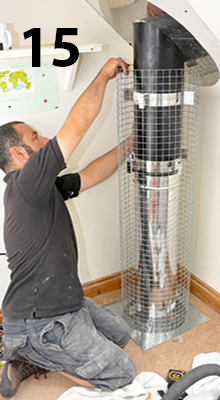 This prevents heat radiated from the flue causing damage to the surrounding joists. 10. James taps the outlet pipe into the top of the woodburning stove and then lowers the twin wall flue down from the room above Should the woodburning stove need to be moved for any reason in the future, the upper section of pipe can be lifted up to allow this. 11. 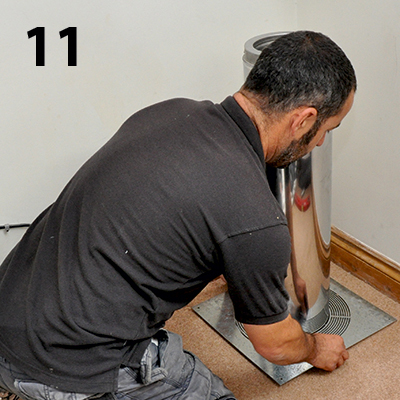 A firestop needs to be fitted where the flue enters the first floor, with any combustible materials, like carpet, cut back to meet the edges of the firestop. 12. 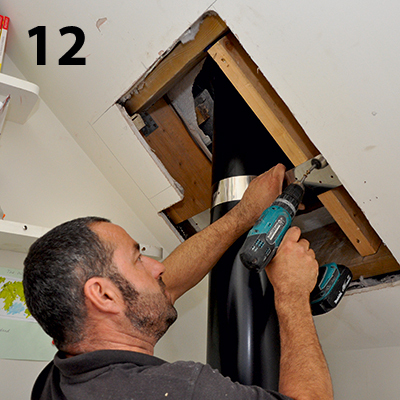 James fits the section of the twin-wall flue that goes through the roof and secures it with a rafter support. 13. Out on the roof, the most precarious part of the job comes with the fitting of the top section of the flue. James has pre-assembled the pipe on the ground using steel locking bands to hold it together. Another locking band secures the top pipe to the section emerging from the roof. 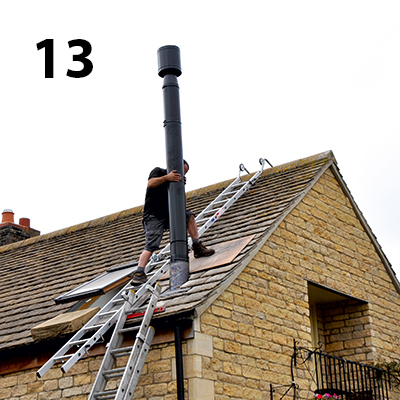 The top of the flue is required to project 600mm above the ridge of the roof. 14. Plasterboard is cut, shaped and screwed to the joists where the flue pipe goes through the ceiling in the room above the woodburner — a skim of plaster will be needed over the joints later on. 15. 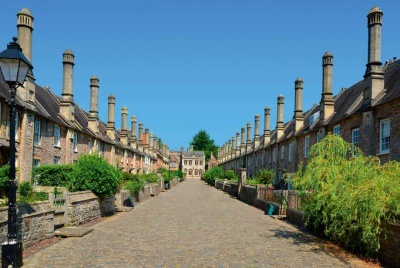 Where a flue pipe enters a room from floor to ceiling, as here, there needs to be a physical barrier to prevent it from coming into contact with combustible materials. The cage fitted here is a simple – if inelegant – solution. Another option would be to box the pipe in using fireboard. 16. 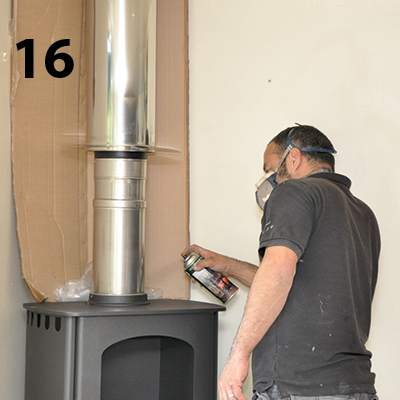 James sprays the flue with dedicated stove paint to match the woodburner. 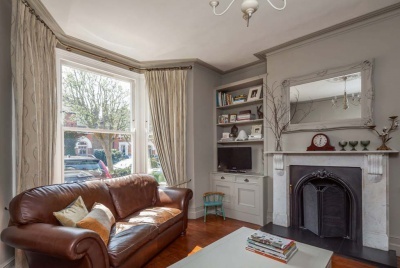 With stoves available in a number of different colours, this is a cost-effective way to get everything looking just right. 17. The final job is to light and test the woodburning stove. James runs through the lighting procedure and then lets the unit get up to temperature before signing it off and supplying the necessary HETAS certification. 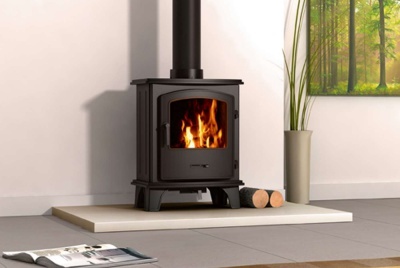 A magnetic surface thermometer indicates the performance of the woodburning stove — this one is quickly up to the ideal 260°C running temperature, indicating an efficient, clean burn. Can you advise of the full installation cost and can an internal flue be angled at all as we would like our exit through the roof to be on the ridge . 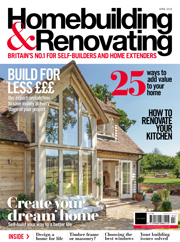 It cost Ben (the author) £2,6000 to have a HETAS engineer supply and fit a twin-wall flue which ran through the room above before reaching the roof. 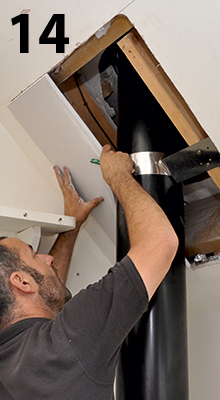 You can fit a twin-wall flue kit yourself on a DIY basis which will cost you about £1000. It is a big saving but you would then need to have the work signed off by a Building Inspector which would add to the cost. 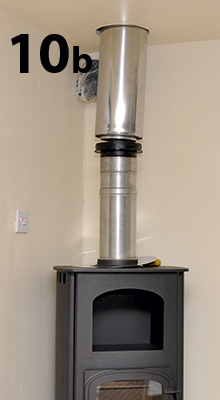 A flue can be angled, but be aware than any angling will affect the draw slightly so limit the number of turns. 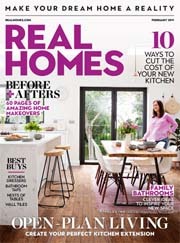 I would personally advise choosing a HETAS installer over the DIY option if your installation is less straightforward (i.e.. angled!). We shall have a look at a qualified installer as we have a three storey house and the aim is to get the flue exit as close to the ridge as we can.